The Infant Jesus reminds us today that God's truth is something lovable. What can be more attractive than the sight of a dear little Child? Thus Jesus did not choose to come as a great and powerful Lord. Rather, he came as a small Infant in order to move us more easily to love Him in return. Jesus came not to judge the world, but to save it. 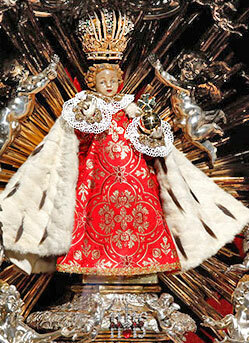 The Infant King remains majestic yet approachable; divine, yet human; the Almighty, but not intimidating. Devotion to the Infant King reminds us that the Incarnation does not remove respect from our relationship with God, but removes the distance. The Spirituality of such a devotion encourages us to imitate the "smaller" and more discreet virtues of true Christian life. From His Infancy, Christ already exhorts us to imitate His humility and meekness; to depend upon the Heavenly Father and the Blessed Virgin Mary: that our charity may be sweet and inviting; and our heart innocent and confident. Statues of the Infant Jesus often depict His right hand raised in blessing. He comes as a little Child so that we would have confidence and not fear. He holds the globe, for from His Conception He is already King of the Universe; but His Kingdom is a Kingdom of truth and life: a Kingdom of grace and holiness: a Kingdom of justice, love, and peace. (Preface of the Kingship of Our Lord) The effects of the Infant King reigning in our lives are similar to the love and joy which a child brings to the household. Devotion to the Child Jesus dates back to the early Church. However, it really began to develop during the Middle Ages. St. Francis of Assisi, St. Anthony promoted it in the 13th century. Statues of the Infant Jesus then were made in various parts of Europe. 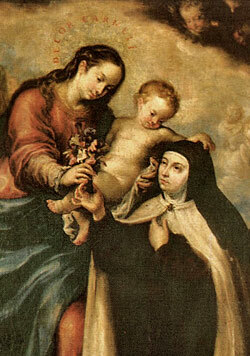 In the 16th century and during the Baroque period which followed, the popularity of the Child Jesus grew in Spain under the influence of St. Teresa of Avila, the reformer of the Carmelite Order. St. Teresa would carry around with her statues of the Infant Jesus and enshrine them in the new convents which she founded. In Baroque Spain it became the custom to dress these statues in special robes as a sign of the royalty of Christ. From Spain, statues of the Infant Jesus were brought around the world. Missionaries brought the statue of the Holy Child to the Philippines where it is stilled honored at Cebu. A Spanish princess brought a statue of the Infant Child to Prague when she married a Czech nobleman. She gave the statue to the Carmelites in Prague, who loved this devotion, and miracles happened. Like these historic statues, the Infant King statue venerated at the Shrine of Christ the King in Chicago originates from late 17th century Spain. Thus this statue is not meant to be a copy of another, but it is truly an original statue which came forth from this wave of devotion to the Infant Jesus during this time in history. Following in the widespread tradition which celebrates the 25th day of the month in honor of the day on which Christ was born, a Novena of prayer is offered from the 17th until the 25th day of each month at the Shrine of Christ the King in Chicago. Prayer intentions are gathered and placed before the venerable statue of the Infant King during this Novena. Along with these prayer requests, devotees of the Christ Child also offer a candle or a flower to be placed at the altar of the Infant King as visible signs of prayer and love. These gift offerings enhance the beauty of the sanctuary and contribute to its restoration. Devotees of the Infant King are welcome to participate in an age-old Catholic tradition of the "Ex Voto." In thanksgiving to God for blessings received, signs of gratitude such as plaques and images would be given to the shrine as testimony of God's mercy, thus inspiring others to deeper devotion and confidence in God. 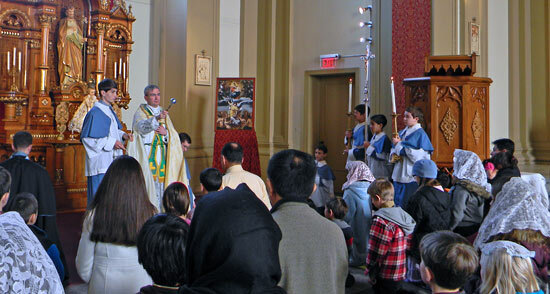 The Shrine of Christ the King has incorporated this beautiful tradition in a virtual way on this website. See the beautiful testimonials which have been given by devotees of Christ our Infant King from around the world. You are invited to share your faith in the Christ Child in thanksgiving for the graces which He has given to you. On the 25th day of each month, a High Mass with Renaissance Choral Music is celebrated in honor of Christ the Infant King. 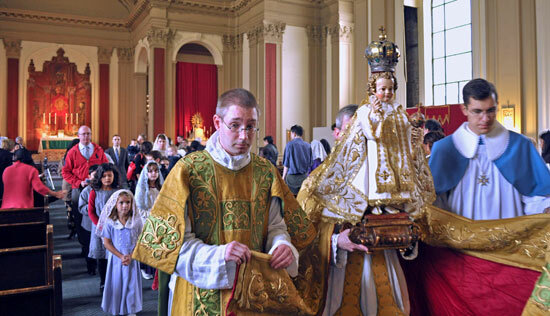 After Mass this 300 year-old statue is carried in a procession to which children of all ages are invited to participate. A children's prayer and hymn are offered followed by a blessing for the children.